Christian Dior Hypnotic Poison is a symbol of seduction and passion. 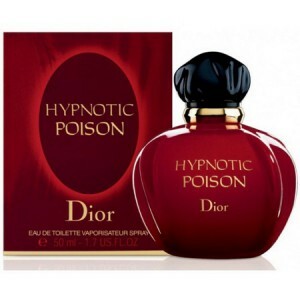 Christian Dior Hypnotic Poison 100ml. Eau De Parfum - Madonna's favorite flavor. Classic. This fragrance follows the mythic track Poison'a - diabolical and mysterious fragrance, a magical elixir of modern times, which expresses the sensuality of your era. Extravagant and intoxicating, Hypnotic Poison - perfume of femininity and boldness. Mysterious harmony, born of an alloy of four aspects opposed to each other: sharp and intoxicating note of almond, more rich and precious note of jasmine "sambac" lovely floral note of rose and lily of the valley and the hypnotic and sensual trail of vanilla and musk. Date fragrance: oriental Top notes: bitter almond, caraway note "Hearts": jasmine Base notes: vanilla, musk. First notes of aroma Christian Dior Hypnotic Poison resemble perfume Poison - classic scent 80s. In place of the first impression comes a unique and incomparable flavor that has not previously met in any perfume. At Christian Dior Hypnotic Poison merge four contrasting notes that create a magical charm, making these spirits in an incredibly seductive fragrance. Fragrance Christian Dior Hypnotic Poison - a symbol of seduction and passion, magic elixir, which is able to bring to mind. Begins flavor flavor apricots, plums and bitter almonds, lily of the valley notes are disclosed, rose and jasmine in the loop - with vanilla musk. It is designed for women decisive, sensual and elegant. This fragrance will make the company not only in winter but in the summer months because each piece of myself uncover something new. Order it by yourself and reveal the true face of the toilet water. It has been launched in 1998.